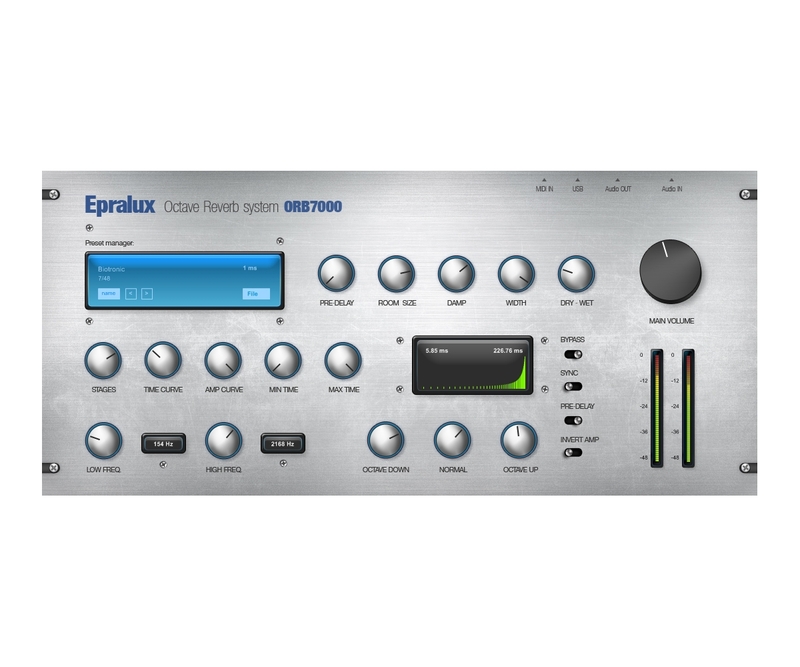 Epralux ORB7000 – octave reverb system is not classic reverb simulation of real acoustic space. ORB7000 is special, artistic and creative octave/pitch-shifting reverb system for creating special sound and space effects, new sound colors and unique experimental sounds. Main feature that makes ORB7000 different is special particle based pitch-shifting unit that splits reverbed signal to 3 sub-signals: octave down, normal, octave up. Then sound is split for very small time sequences (in milliseconds), octave down circuit play sound de-tuned -1 octave while octave-up circuit plays sound one octave +1 pitch shifted. This create really unique sound effects (to hear this effect best try ORB7000 with melodical sund samples like guitar, piano, synthesizer or human voice). ORB7000 is usable in any musical style from classic pop, rock to more experimental styles like ambient music, cinematic music or electronic dance music. 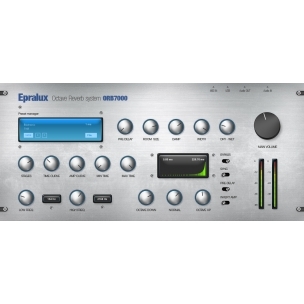 This plug-in is compatible with OS Windows 2000 / XP / Vista/7, processing 32 bit, you will need VST/VSTi compliant host (Cubase, Nuendo, Fruity loops studio etc.). 64 bit user can use plug-in with using jBridge (64 to 32bit VST) from http://jstuff.wordpress.com/jbridge/. • "The reverb that this ORB7000 plugin creates is very rich and adjustable. There are many parameters to set and change. There are of course the regular parameters for a reverb, the pre-delay, damping, room size, width, dry/wet mix make the foundation for the reverbration. The amplification parameters allow for a volume-wise differently timed and shaped reverbration ramping. The filter section comes with low- and high pass filter for the reverbrated sound. The reverbration generated on an octave below, the original octave and an octave above - adjustable in level for each octave - allows to enhance sound in a way that differs from regular reverbs. The now released version (first version) of the ORB7000 doesn't work as good as the "personal" version I received after mailing with support of 123Creative, who created an excellent plugin with what it seems a buggy protection mechanism on top which crashes on multiple instances of the released ORB7000. So, if you purchase the plugin, you could experience crashes, which for me was solved by their support by sending me a "personal" version. I had no problem with the purchase and downloading and registration. So, it's actually an excellent plugin for me." • "They make exellent software and for good prices." • "Your toys were so excited .. that i couldnt resist to buy it ;) ahhahahaa..."